1a. Lamina more or less as long as petiole or shorter. Pseudo-umbels per inflorescence 1-2. Pseudo-umbels of 1-3 flowers. Hypanthium 3-9 mm, petals auricled. Posterior petals recurved close to the tip. 1b. Lamina conspicuously longer than petiole. Pseudo-umbels per inflorescence at least 3. 2a. Pseudo-umbels of at least 3 flowers. 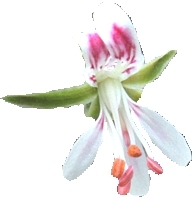 Hypanthium 3-9 mm, petals auricled. 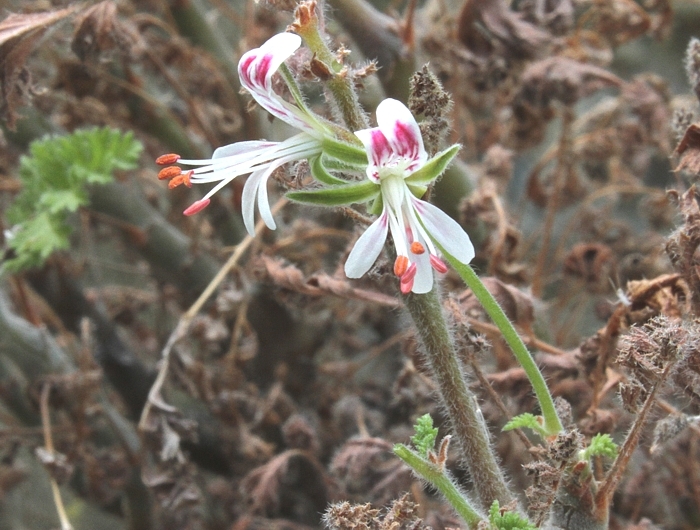 Pelargonium alternans ssp. alternans Wendl. Hort. Herrenh. 1, t. 10 (1798/88?) 14. 2b. Pseudo-umbels of 1-3 flowers. Hypanthium usually conspicuously longer than 10 mm, petals not auricled. 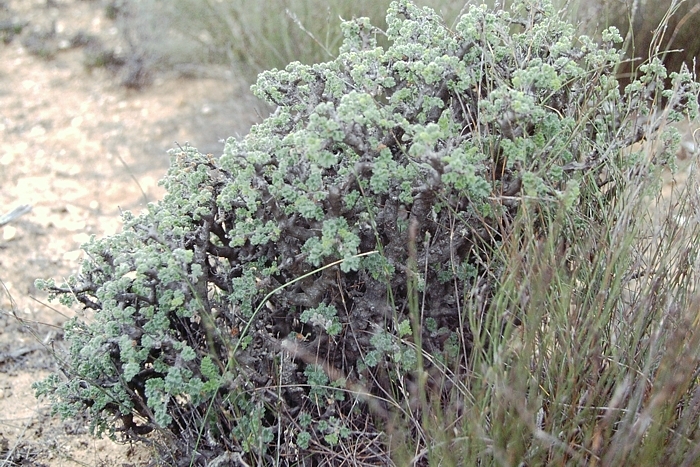 Succulent, zig-zag shaped and conspicuously branched shrub up to 40 cm high. Bark brown to grey, smooth. Stems microscopically pubescent. Leaves pinnately compound, conspicuously hirsute with glandular hairs interspersed, lamina oblong, 20-60x10-20 mm, pinnae with rounded apices, stipules triangular, 1x1-1.5 mm, initially persistent, finaly deciduous. Unbranched, with smaller foliar leaves, bearing pseudoumbels with 1-6 flowers. Peduncle 1.8-5 mm. 5, lanceolate, 1.5-2x7 mm, reflexed. Hypanthium 5-20 mm. White to pinkish, posterior narrowly obovate to oblong, cca. 8-15 x 1.5-2.5 mm, reflexed, auriculate or not, with or without markings, anterior spathulate, slightly shorter, reflexed at less than 90o, with or without markings. If P. alternans has the luxury to grow freely then it develops into a rather straggly shrub reminiscent of some greenhouse grown plants. The plant above is a rare sight: a fairly old and ungrazed P. alternans ssp. alternans at Boschkloof near Citrusdal, W Cape, neighbour to P. ellaphieae. 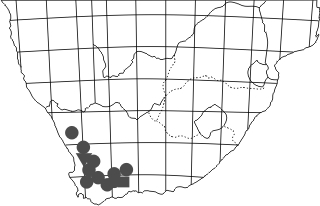 In the original publication, the distribution of P. alternans ssp. parviinflorescens is described as limited to Pakhuis Pass. 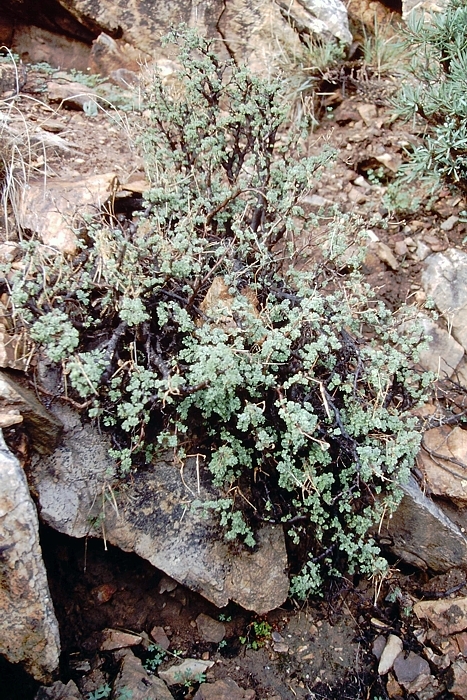 Here is a plant from Oorlogskloof close to Nieuwoudtville, which is 50 km N of the type location, meaning that the subspecies must have a broader distribution in the N Cedarberge and the Bokkeveld escarpment. With the growth form very similar to the type subspecies, P. alternans ssp. longicalcar is distributed in the extreme SE area of the distribution of the species as a whole: Anysberg, Outenikwa Mts and the Groot Swartberge. 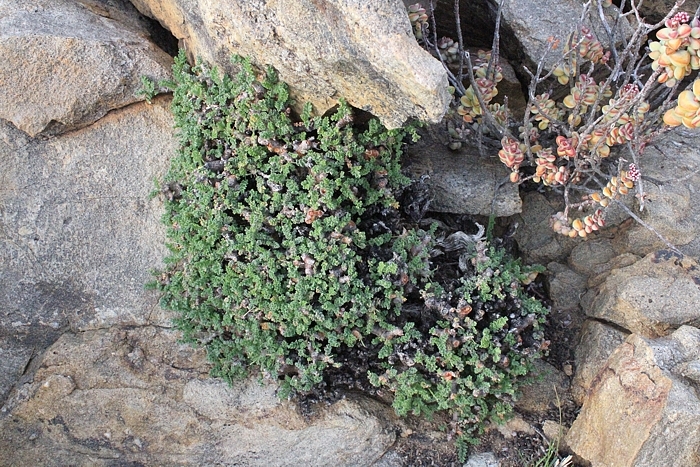 Here a plant from Rooinek Pass with the most typical habit of the species, abundantly 'pruned' by livestock. The bonsai quality of these plants is in a stark contrast to the plant from Boschkloof shown above. coralinum (Eckl. & Zeyh.) Steud. 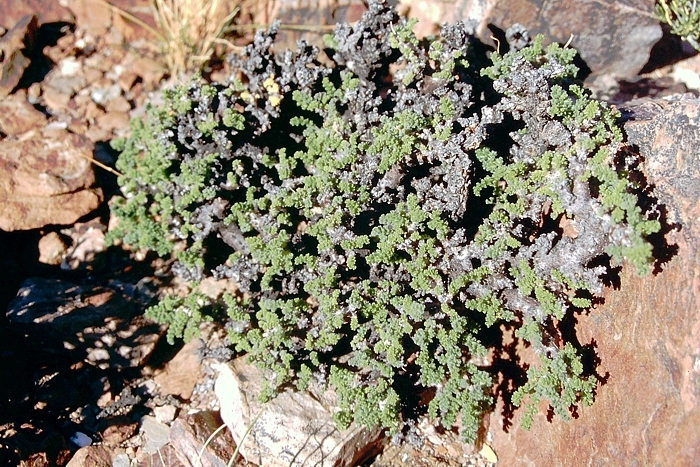 microphyllum (Eckl. & Zeyh.) Steud. With grateful thanks to Dr M Becker for discussions of this species.